Provides a theoretical foundation as well as practical tools for the analysis of multivariate data, using case studies and MINITAB computer macros to illustrate basic and advanced quality control methods. This work offers an approach to quality control that relies on statistical tolerance regions, and discusses computer graphic analysis highlighting multivariate profile charts. Quality control with multivariate data; the multivariate normal distribution in quality control; quality control with externally assigned targets; quality control with internal targets - multivariate process capability studies; quality control with targets from a reference sample; analyzing data with multivariate control charts; detection of out-of-control characteristics; the statistical tolerance regions approach; multivariate quality control with units in batches; applications of principal components; additional graphical techniques for multivariate quality control; implementing multivariate quality control; appendix 1 - MINITAB (TM) macros for multivariate quality control; appendix 2 - the data from case studies; appendix 3 - review of matrix algebra for statistics with MINIATB (TM) computations. 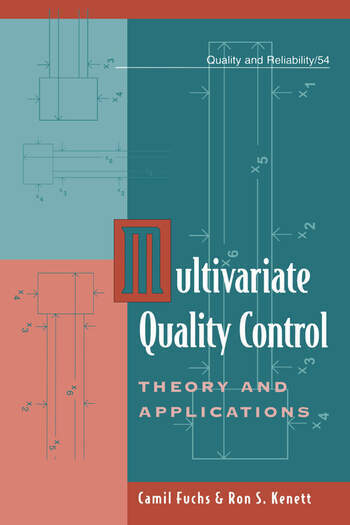 "This monograph is a practical introduction to the concepts and execution of multivariate quality control in industrial settings. . .. . . .nice supplementary text for advanced students, or a reference for seasoned professionals. "